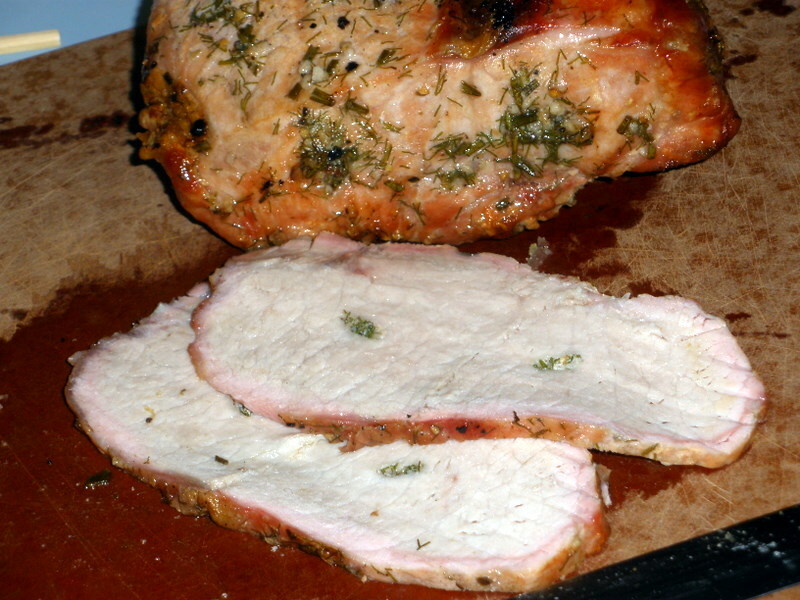 Boneless pork loin is an efficient cut: no bone, little or no fat to trim away, and a perfectly sliceable shape. Still, it can be a disappointing cut when treated poorly: today’s pork is exceedingly lean and oh-so-easy to overcook into a dry, cottony state. Avoid overcooking by relying on a thermometer, rather than adhering to a specific cooking time. Take the pork out of the oven or off the grill when it reaches an internal temperature of 140 degrees, and rest it for at least 20 minutes before slicing or serving. Without a bone or much fat to add flavor to the loin, it’s up to the cook to make up for inherent deficiencies. At this time of year, I turn to my garden for raw ingredients as often as possible: a quick look around the raised beds yielded fresh fennel fronds, sage, and rosemary. Coarsely chopped and mixed with garlic (run through a press), kosher salt, and black pepper, the herbs only needed a bit of olive oil to deliver their aromatic payload. After rubbing the mixture into the meat, I cut two narrow, deep incisions into the loin and pushed the herb paste inside using a disposable bamboo chopstick. The loin reached 140 degrees (internally) after just an hour’s cooking at 350 degrees on the Big Green Egg…just enough time to bake a few Yukon Gold potatoes alongside the roast.